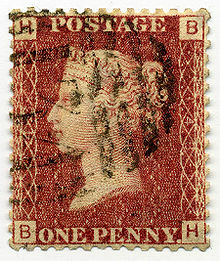 The Penny Red was used in the UK for many years, and comes in hundreds of variations which are subject to detailed study by philatelists. 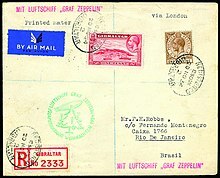 Zeppelin mail from Gibraltar to Rio de Janeiro, Brazil via Berlin on the Christmas flight (12th South American flight) of 1934. A large stamp show (philatelic exhibition) at which collectors and dealers meet. Philately (/fɪˈlætəliː/; fi-LAT-ə-lee) is the study of stamps and postal history and other related items. It also refers to the collection, appreciation and research activities on stamps and other philatelic products. Philately involves more than just stamp collecting, which does not necessarily involve the study of stamps. It is possible to be a philatelist without owning any stamps. For instance, the stamps being studied may be very rare, or reside only in museums. The word "philately" is the English translation of the French "philatélie", coined by Georges Herpin in 1864. Herpin stated that stamps had been collected and studied for the previous six or seven years and a better name was required for the new hobby than timbromanie, which was disliked. He took the Greek root word φιλ(ο)- phil(o)-, meaning "an attraction or affinity for something", and ἀτέλεια ateleia, meaning "exempt from duties and taxes" to form "philatelie". The introduction of postage stamps meant that the receipt of letters was now free of charge, whereas before stamps it was normal for postal charges to be paid by the recipient of a letter. The alternative terms "timbromania", "timbrophily" and "timbrology" gradually fell out of use as philately gained acceptance during the 1860s. Thematic philately, also known as topical philately, is the study of what is depicted on individual stamps. There are hundreds of popular subjects, such as birds, and ships, poets, presidents, monarchs, maps, aircraft, space craft, sports, and insects on stamps. Stamps depicted on stamps also constitute a topical area of collecting. Interesting aspects of topical philately include design mistakes and alterations; for instance, the recent editing out of cigarettes from the pictures used for United States stamps, and the stories of how particular images came to be used. Postal history studies the postal systems and how they operate and, or, the study of postage stamps and covers and associated material illustrating historical episodes of postal systems both before and after the introduction of the adhesive stamps. It includes the study of postmarks, post offices, postal authorities, postal rates and regulations and the process by which letters are moved from sender to recipient, including routes and choice of conveyance. A classic example is the Pony Express, which was the fastest way to send letters across the United States during the few months that it operated. Covers that can be proven to have been sent by the Pony Express are highly prized by collectors. Aerophilately is the branch of postal history that specializes in the study of airmail. Philatelists have observed the development of mail transport by air from its beginning, and all aspects of airmail services have been extensively studied and documented by specialists. Astrophilately is the branch of postal history that specializes in the study of stamps and postmarked envelopes that are connected to the outer space. Postal stationery includes stamped envelopes, postal cards, letter sheets, aérogrammes (air letter sheets) and wrappers, most of which have an embossed or imprinted stamp or indicia indicating the prepayment of postage. Erinnophilia is the study of objects that look like stamps, but are not postal stamps. Examples include Easter Seals, Christmas Seals, propaganda labels, and so forth. Philatelic literature documents the results of philatelic study and includes thousands of books and periodicals. Revenue philately is the study of stamps used to collect taxes or fees on such things as, legal documents, court fees, receipts, tobacco, alcoholic drinks, drugs and medicines, playing cards, hunting licenses and newspapers. Maximaphily is the study of Maximum Cards. Maximum Cards can be defined as a picture post card with postage stamp on the same theme and a cancellation, with a maximum concordance between all three. Youth philately is the study of stamps with colorful characters. It is mainly aimed at getting kids to be interested in stamp collecting. Philately uses a number of tools, including stamp tongs (a specialized form of tweezers) to safely handle the stamps, a strong magnifying glass and a perforation gauge (odontometer) to measure the perforation gauge of the stamp. The identification of watermarks is important and may be done with the naked eye by turning the stamp over or holding it up to the light. If this fails then watermark fluid may be used, which "wets" the stamp to reveal the mark. Some tools are available online. These are collector clubs, enthusiast forums, marketplaces, and trading platforms. Other common tools include stamp catalogs, stamp stock books and stamp hinges. ^ Carlton, R. Scott. The International Encyclopaedic Dictionary of Philately, Iola WI: Krause Publications, 1997, p.196. ISBN 0-87341-448-9. ^ Herpin, Georges. "Bapteme" in Le Collectionneur de Timbres-Postes, Vol.I, 15 November 1864, p.20. ^ a b Williams, L.N. & M. Fundamentals of Philately. State College: The American Philatelic Society, 1971, p.20. ^ Sutton, R.J. & K.W. Anthony. The Stamp Collector's Encyclopaedia. 6th edition. London: Stanley Paul, 1966, p.232. ^ "Colnect Marketplace Has Been Launched". PR.com. Retrieved 11 March 2019. Sutton, R.J. & K.W. Anthony. The Stamp Collector's Encyclopaedia. 6th edition. London: Stanley Paul, 1966. Williams, L.N. & M. Fundamentals of Philately. State College: The American Philatelic Society, 1971. Wikimedia Commons has media related to Philately. Look up philately in Wiktionary, the free dictionary. Can Plastic Films Damage My Stamps? Translated from an article by Ib Krarup Rasmussen published in Dansk Filatelistisk Tidsskrift Number 4, 2008. Stamps and Plastics – the Good and the Bad by Roger Rhoads, 2009.